GENESEE COUNTY – It is the busiest time of year for the Old Newsboys of Flint, and they started out the holiday season with their annual meeting Nov. 1. Founded in 1924, the Old Newsboys of Flint has served 812,000 children since it first started helping those in need 94 years ago. Last year alone, the organization helped 6,179 children have a Christmas and collected and gave away some 550 new coats and shoes. Chris Hamilton, executive director of the Old Newsboys of Flint, said signup for those seeking help this year just started Oct. 29 and runs through Dec. 21. While most of the organization’s gifts to children in need have already been purchased, Hamilton said the Old Newsboys still need toys, underwear, socks and stocking caps for children. 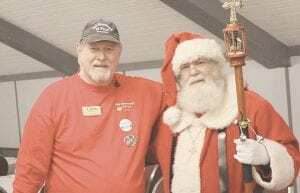 Known throughout Genesee County as the face of the Old Newsboys, Hamilton said helping out children in need is something that makes him feel great. Missing this year from the annual meeting were two well-known Old Newsboys who passed away in 2018. Members Frank McCarty and Joe Florida. Florida, who long portrayed Santa Claus for the organization, was remembered by many of those who worked with him through Old Newsboys. Hamilton said Florida never forgot that the Old Newsboys helped him and his family after his father died at age 39 in 1955. Just during the Thursday morning breakfast, more than $35,000 in donations were presented to the Old Newsboys, the contributors including GM Flint Tool and Die, Complete Runner and the United Way. Hamilton said anyone needing the assistance of the Old Newsboys of Flint to help give a child Christmas this year should call 810-744-1840 or visit 6255 Taylor Dr. in Flint.